Quilt in a Day Egg Money Quilts. 1930's Vintage Samplers. 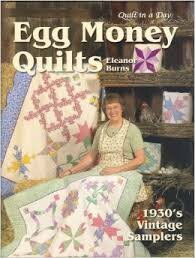 Egg Money Quilts in an "Eggstravaganza" of thirteen traditional patterns that gained popularity in the 1930s. In addition to two sampler quilt layouts, yardage charts are provided for five patterns in various quilt sizes. And to tempt your creativity, you will find a treasury of projects.